In computing, an optical disc drive (ODD) is a disc drive that uses laser light or electromagnetic waves within or near the visible light spectrum as part of the process of reading or writing data to or from optical discs. Some drives can only read from certain discs, but recent drives can both read and record, also called burners or writers. Compact discs, DVDs, and Blu-ray discs are common types of optical media which can be read and recorded by such drives. Optical disc drives that are no longer in production include CD-ROM drive, CD writer drive, combo (CD-RW/DVD-ROM) drive, and DVD writer drive supporting certain recordable and rewritable DVD formats (such as DVD-R(W) only, DVD+R(W) only, DVD-RAM only, and all DVD formats except DVD-R DL). As of 2015[update], DVD writer drive supporting all existing recordable and rewritable DVD formats is the most common for desktop PCs and laptops. There are also the DVD-ROM drive, BD-ROM drive, Blu-ray Disc combo (BD-ROM/DVD±RW/CD-RW) drive, and Blu-ray Disc writer drive. Optical disc drives are an integral part of standalone appliances such as CD players, DVD players, Blu-ray disc players, DVD recorders, certain desktop video game consoles, such as Sony PlayStation 4, Microsoft Xbox One, Nintendo Wii U, and Sony PlayStation 3, and certain portable video game consoles, such as Sony PlayStation Portable. They are also very commonly used in computers to read software and consumer media distributed on disc and to record discs for archival and data exchange purposes. Floppy disk drives, with capacity of 1.44 MB, have been made obsolete: optical media are cheap and have vastly higher capacity to handle the large files used since the days of floppy discs, and the vast majority of computers and much consumer entertainment hardware have optical writers. USB flash drives, high-capacity, small, and inexpensive, are suitable where read/write capability is required. Disc recording is restricted to storing files playable on consumer appliances (films, music, etc. ), relatively small volumes of data (e.g. a standard DVD holds 4.7 gigabytes) for local use, and data for distribution, but only on a small scale; mass-producing large numbers of identical discs is cheaper and faster than individual recording. Optical discs are used to back up relatively small volumes of data, but backing up of entire hard drives, which as of 2015[update] typically contain many hundreds of gigabytes or even multiple terabytes, is less practical. Large backups are often instead made on external hard drives, as their price has dropped to a level making this viable; in professional environments magnetic tape drives are also used. The first laser disc, demonstrated in 1972, was the Laservision 12-inch video disc. The video signal was stored as an analog format like a video cassette. The first digitally recorded optical disc was a 5-inch audio compact disc (CD) in a read-only format created by Sony and Philips in 1975. The first erasable optical disc drives were announced in 1983, by Matsushita (Panasonic), Sony, and Kokusai Denshin Denwa (KDDI). Sony eventually released the first commercial erasable and rewritable 5.25-inch optical disc drive in 1987, with dual-sided discs capable of holding 325 MB per side. The CD-ROM format was developed by Sony and Denon, introduced in 1984, as an extension of Compact Disc Digital Audio and adapted to hold any form of digital data. The CD-ROM format has a storage capacity of 650 MB. Also in 1984, Sony introduced a LaserDisc data storage format, with a larger data capacity of 3.28 GB. The DVD format, developed by Panasonic, Sony, and Toshiba, was released in 1995, and was capable of holding 4.7 GB per layer. The first Blu-Ray prototype was unveiled by Sony in October 2000, and the first commercial recording device was released to market on April 10, 2003. In January 2005, TDK announced that they had developed an ultra-hard yet very thin polymer coating ("Durabis") for Blu-ray discs; this was a significant technical advance because better protection was desired for the consumer market to protect bare discs against scratching and damage compared to DVD. Technically Blu-ray Disc also required a thinner layer for the narrower beam and shorter wavelength 'blue' laser. The first BD-ROM players (Samsung BD-P1000) were shipped in mid-June 2006. The first Blu-ray Disc titles were released by Sony and MGM on June 20, 2006. The first mass-market Blu-ray Disc rewritable drive for the PC was the BWU-100A, released by Sony on July 18, 2006. 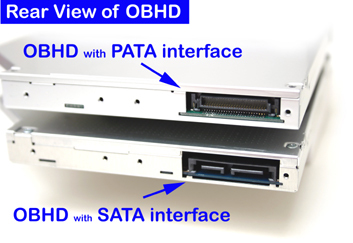 The most important part of an optical disc drive is an optical path, placed in a pickup head (PUH), usually consisting of a semiconductor laser, a lens for focusing the laser beam, and photodiodes for detecting the light reflected from the disc's surface. Initially, CD-type lasers with a wavelength of 780 nm (within the infrared) were used. For DVDs, the wavelength was reduced to 650 nm (red color), and for Blu-ray Disc this was reduced even further to 405 nm (violet color). Two main servomechanisms are used, the first to maintain the proper distance between lens and disc, to ensure the laser beam is focused as a small laser spot on the disc. The second servo moves the pickup head along the disc's radius, keeping the beam on the track, a continuous spiral data path. Optical disc media are 'read' beginning at the inner radius to the outer edge. The optical sensor out of a CD/DVD drive. The two larger rectangles are the photodiodes for pits, the inner one for land. This one also includes amplification and minor processing. On read only media (ROM), during the manufacturing process the tracks are formed by pressing a thermoplastic resin into a glass 'master' with raised 'bumps' on a flat surface, creating pits and lands in the plastic disk. Because the depth of the pits is approximately one-quarter to one-sixth of the laser's wavelength, the reflected beam's phase is shifted in relation to the incoming beam, causing mutual destructive interference and reducing the reflected beam's intensity. This is detected by photodiodes that create corresponding electrical signals. An optical disk recorder encodes (also known as burning) data onto a recordable CD-R, DVD-R, DVD+R, or BD-R disc (called a blank) by selectively heating parts of an organic dye layer with a laser. This changes the reflectivity of the dye, thereby creating marks that can be read like the pits and lands on pressed discs. For recordable discs, the process is permanent and the media can be written to only once. While the reading laser is usually not stronger than 5 mW, the writing laser is considerably more powerful. The higher the writing speed, the less time a laser has to heat a point on the media, thus its power has to increase proportionally. DVD burners' lasers often peak at about 200 mW, either in continuous wave and pulses, although some have been driven up to 400 mW before the diode fails. For rewritable CD-RW, DVD-RW, DVD+RW, DVD-RAM, or BD-RE media, the laser is used to melt a crystalline metal alloy in the recording layer of the disc. Depending on the amount of power applied, the substance may be allowed to melt back (change the phase back) into crystalline form or left in an amorphous form, enabling marks of varying reflectivity to be created. Double-sided media may be used, but they are not easily accessed with a standard drive, as they must be physically turned over to access the data on the other side. Double layer (DL) media have two independent data layers separated by a semi-reflective layer. Both layers are accessible from the same side, but require the optics to change the laser's focus. Traditional single layer (SL) writable media are produced with a spiral groove molded in the protective polycarbonate layer (not in the data recording layer), to lead and synchronize the speed of recording head. Double-layered writable media have: a first polycarbonate layer with a (shallow) groove, a first data layer, a semi-reflective layer, a second (spacer) polycarbonate layer with another (deep) groove, and a second data layer. The first groove spiral usually starts on the inner edge and extends outwards, while the second groove starts on the outer edge and extends inwards. Some drives support Hewlett-Packard's LightScribe photothermal printing technology for labeling specially coated discs. The rotational mechanism in an optical drive differs considerably from that of a hard disk drive's, in that the latter keeps a constant angular velocity (CAV), in other words a constant number of revolutions per minute (RPM). With CAV, a higher throughput is generally achievable at the outer disc compared to the inner. On the other hand, optical drives were developed with an assumption of achieving a constant throughput, in CD drives initially equal to 150 KiB/s. It was a feature important for streaming audio data that always tend to require a constant bit rate. But to ensure no disc capacity was wasted, a head had to transfer data at a maximum linear rate at all times too, without slowing on the outer rim of disc. This led to optical drives—until recently—operating with a constant linear velocity (CLV). The spiral groove of the disc passed under its head at a constant speed. The implication of CLV, as opposed to CAV, is that disc angular velocity is no longer constant, and the spindle motor needed to be designed to vary its speed from between 200 RPM on the outer rim and 500 RPM on the inner. Later CD drives kept the CLV paradigm, but evolved to achieve higher rotational speeds, popularly described in multiples of a base speed. As a result, a 4× drive, for instance, would rotate at 800-2000 RPM, while transferring data steadily at 600 KiB/s, which is equal to 4 × 150 KiB/s. For DVDs, base or 1× speed is 1.385 MB/s, equal to 1.32 MiB/s, approximately nine times faster than the CD base speed. For Blu-ray drives, base speed is 6.74 MB/s, equal to 6.43 MiB/s. The Z-CLV recording pattern is easily visible after burning a DVD-R.
Because keeping a constant transfer rate for the whole disc is not so important in most contemporary CD uses, a pure CLV approach had to be abandoned to keep the rotational speed of the disc safely low while maximizing data rate. Some drives work in a partial CLV (PCLV) scheme, by switching from CLV to CAV only when a rotational limit is reached. But switching to CAV requires considerable changes in hardware design, so instead most drives use the zoned constant linear velocity (Z-CLV) scheme. This divides the disc into several zones, each having its own constant linear velocity. A Z-CLV recorder rated at "52×", for example, would write at 20× on the innermost zone and then progressively increase the speed in several discrete steps up to 52× at the outer rim. Without higher rotational speeds, increased read performance may be attainable by simultaneously reading more than one point of a data groove, but drives with such mechanisms are more expensive, less compatible, and very uncommon. Both DVDs and CDs have been known to explode  when damaged or spun at excessive speed. This imposes a constraint on the maximum speed (56× for CDs or around 18× in the case of DVDs) at which drives can operate. Current optical drives use either a tray-loading mechanism, where the disc is loaded onto a motorized or manually operated tray, or a slot-loading mechanism, where the disc is slid into a slot and drawn in by motorized rollers. With both types of mechanisms, if a CD or DVD is left in the drive after the computer is turned off, the disc cannot be ejected using the normal eject mechanism of the drive. However, tray-loading drives account for this situation by providing a small hole where one can insert a straightened paperclip to manually open the drive tray to retrieve the disc. Slot-loading optical disc drives have the disadvantages that they cannot usually accept the smaller 80 mm discs (unless 80 mm optical disc adapter is used) or any non-standard sizes, usually have no emergency eject hole or eject button, and therefore have to be disassembled if the optical disc cannot be ejected normally. However, the Nintendo Wii, because of backward compatibility with Nintendo GameCube games, and PlayStation 3 video game consoles are able to load standard size DVDs and 80 mm discs in the same slot-loading drive. A small number of drive models, mostly compact portable units, have a top-loading mechanism where the drive lid is opened upwards and the disc is placed directly onto the spindle (for example, all PlayStation One consoles, most portable CD players, and some standalone CD recorders feature top-loading drives). These sometimes have the advantage of using spring-loaded ball bearings to hold the disc in place, minimizing damage to the disc if the drive is moved while it is spun up. Some early CD-ROM drives used a mechanism where CDs had to be inserted into special cartridges or caddies, somewhat similar in appearance to a 3.5" floppy diskette. This was intended to protect the disc from accidental damage by enclosing it in a tougher plastic casing, but did not gain wide acceptance due to the additional cost and compatibility concerns—such drives would also inconveniently require "bare" discs to be manually inserted into an openable caddy before use. Ultra Density Optical and Universal Media Disc use optical disc cartridges. There were also some early CD-ROM drives for desktop PCs in which its tray-loading mechanism will eject slightly and user has to pull out the tray manually to load CD, similar to the tray ejecting method used in internal optical disc drives of modern laptops and modern external slim portable optical disc drives. Like the top-loading mechanism, they have spring-loaded ball bearings on the spindle. Digital audio output, analog audio output, and parallel ATA interface. Most internal drives for personal computers, servers, and workstations are designed to fit in a standard 5.25" drive bay and connect to their host via an ATA or SATA interface. Additionally, there may be digital and analog outputs for audio. The outputs may be connected via a header cable to the sound card or the motherboard. At one time, computer software resembling CD players controlled playback of the CD. Today the information is extracted from the disc as data, to be played back or converted to other file formats. External drives usually have USB or FireWire interfaces. Some portable versions for laptops power themselves from batteries or directly from their interface bus. Drives with SCSI interface were made, but they are less common and tend to be more expensive, because of the cost of their interface chipsets, more complex SCSI connectors, and small volume of sales. When the optical disc drive was first developed, it was not easy to add to computer systems. Some computers such as the IBM PS/2 were standardizing on the 3.5" floppy and 3.5" hard disk and did not include a place for a large internal device. Also IBM PCs and clones at first only included a single (parallel) ATA drive interface, which by the time the CDROM was introduced, was already being used to support two hard drives. Early laptops simply had no built-in high-speed interface for supporting an external storage device. Early sound cards could include a CD-ROM drive interface. Initially, such interfaces were proprietary to each CD-ROM manufacturer. A sound card could often have two or three different interfaces which are able to communicate with cdrom drive. A parallel port external drive was developed that connected a printer and the computer. This was slow but an option for laptops. A PCMCIA optical drive interface was also developed for laptops. A SCSI card could be installed in desktop PCs for an external SCSI drive enclosure, though SCSI was typically much more expensive than other options. Internal mechanism of a DVD-ROM Drive. See text for details. The optical drives in the photos are shown right side up; the disc would sit on top of them. The laser and optical system scans the underside of the disc. With reference to the top photo, just to the right of image center is the disc motor, a metal cylinder, with a gray centering hub and black rubber drive ring on top. There is a disc-shaped round clamp, loosely held inside the cover and free to rotate; it's not in the photo. After the disc tray stops moving inward, as the motor and its attached parts rise, a magnet near the top of the rotating assembly contacts and strongly attracts the clamp to hold and center the disc. This motor is an "outrunner"-style brushless DC motor which has an external rotor – every visible part of it spins. Two parallel guide rods that run between upper left and lower right in the photo carry the "sled", the moving optical read-write head. As shown, this "sled" is close to, or at the position where it reads or writes at the edge of the disc. To move the "sled" during continuous read or write operations, a stepper motor rotates a leadscrew to move the "sled" throughout its total travel range. The motor, itself, is the short gray cylinder just to the left of the most-distant shock mount; its shaft is parallel to the support rods. The leadscrew is the rod with evenly-spaced darker details; these are the helical grooves that engage a pin on the "sled". In contrast, the mechanism shown in the second photo, which comes from a cheaply made DVD player, uses less accurate and less efficient brushed DC motors to both move the sled and spin the disc. Some older drives use a DC motor to move the sled, but also have a magnetic rotary encoder to keep track of the position. Most drives in computers use stepper motors. The gray metal chassis is shock-mounted at its four corners to reduce sensitivity to external shocks, and to reduce drive noise from residual imbalance when running fast. The soft shock mount grommets are just below the brass-colored screws at the four corners (the left one is obscured). In the third photo, the components under the cover of the lens mechanism are visible. The two permanent magnets on either side of the lens holder as well as the coils that move the lens can be seen. This allows the lens to be moved up, down, forwards, and backwards to stabilize the focus of the beam. In the fourth photo, the inside of the optics package can be seen. Note that since this is a CD-ROM drive, there is only one laser, which is the black component mounted to the bottom left of the assembly. Just above the laser are the first focusing lens and prism that direct the beam at the disc. The tall, thin object in the center is a half-silvered mirror that splits the laser beam in multiple directions. To the bottom right of the mirror is the main photodiode that senses the beam reflected off the disc. Above the main photodiode is a second photodiode that is used to sense and regulate the power of the laser. The irregular orange material is flexible etched copper foil supported by thin sheet plastic; these are "flexible printed circuits" that connect everything to the electronics (which is not shown). Most optical drives are backward compatible with their ancestors up to CD, although this is not required by standards. Compared to a CD's 1.2 mm layer of polycarbonate, a DVD's laser beam only has to penetrate 0.6 mm in order to reach the recording surface. This allows a DVD drive to focus the beam on a smaller spot size and to read smaller pits. DVD lens supports a different focus for CD or DVD media with same laser. With the newer Blu-ray disc drives, the laser only has to penetrate 0.1 mm of material. Thus the optical assembly would normally have to have an even greater focus range. In practice, the Blu-ray optical system is separate from the DVD/CD system. ^1 Some types of CD-R media with less-reflective dyes may cause problems. ^2 May not work in non MultiRead-compliant drives. ^3 May not work in some early-model DVD-ROM drives. CD-R would not work in any drive that did not have a 780 nm laser. CD-RW compatibility varied. ^4 DVD+RW discs did not work in early video players that played DVD-RW discs. This was not due to any incompatibility with the format but was a deliberate feature built into the firmware by one drive manufacturer. ^5 Read compatibility with existing DVD drives may vary greatly with the brand of DVD+R DL media used. Also drives that predated the media did not have the book code for DVD+R DL media in their firmware (this was not an issue for DVD-R DL though some drives could only read the first layer). ^6 Early DVD+RW and DVD+R recorders could not write to DVD-R(W) media (and vice versa). ^7 Will work in all drives that read DVD-R as compatibility ID byte is the same. ^8 Recorder firmware may blacklist or otherwise refuse to record to some brands of DVD-RW media. ^9 DVD+RW format was released before DVD+R. All DVD+RW only drives could be upgraded to write DVD+R discs by a firmware upgrade. ^10 As of April 2005, all DVD+R DL recorders on the market are Super Multi-capable. ^11 As of October 2006, recently released BD drives are able to read and write CD media. During the times of CD writer drives, they are often marked with three different speed ratings. In these cases, the first speed is for write-once (R) operations, the second speed for re-write (RW) operations, and the last speed for read-only (ROM) operations. For example, a 40×/16×/48× CD writer drive is capable of writing to CD-R media at speed of 40× (6,000 KB/s), writing to CD-RW media at speed of 16× (2,400 KB/s), and reading from a CD-ROM media at speed of 48× (7,200 KB/s). During the times of combo (CD-RW/DVD-ROM) drives, an additional speed rating (e.g. the 16× in 52×/32×/52×/16×) is designated for DVD-ROM media reading operations. For DVD writer drives, Blu-ray disc combo drives, and Blu-ray disc writer drives, the writing and reading speed of their respective optical media are specified in its retail box, user's manual, or bundled brochures or pamphlets. In the late 1990s, buffer underruns became a very common problem as high-speed CD recorders began to appear in home and office computers, which—for a variety of reasons—often could not muster the I/O performance to keep the data stream to the recorder steadily fed. The recorder, should it run short, would be forced to halt the recording process, leaving a truncated track that usually renders the disc useless. In response, manufacturers of CD recorders began shipping drives with "buffer underrun protection" (under various trade names, such as Sanyo's "BURN-Proof", Ricoh's "JustLink" and Yamaha's "Lossless Link"). These can suspend and resume the recording process in such a way that the gap the stoppage produces can be dealt with by the error-correcting logic built into CD players and CD-ROM drives. The first of these drives were rated at 12× and 16×. While drives are burning DVD+R, DVD+RW and all Blu-ray formats, they do not require any such error correcting recovery as the recorder is able to place the new data exactly on the end of the suspended write effectively producing a continuous track (this is what the DVD+ technology achieved). Although later interfaces were able to stream data at the required speed, many drives now write in a 'zoned constant linear velocity'. This means that the drive has to temporarily suspend the write operation while it changes speed and then recommence it once the new speed is attained. This is handled in the same manner as a buffer underrun. The internal buffer of optical disc writer drives is: 8 MiB or 4 MiB when recording BD-R, BD-R DL, BD-RE, or BD-RE DL media; 2 MiB when recording DVD-R, DVD-RW, DVD-R DL, DVD+R, DVD+RW, DVD+RW DL, DVD-RAM, CD-R, or CD-RW media. CD recording on personal computers was originally a batch-oriented task in that it required specialised authoring software to create an "image" of the data to record and to record it to disc in the one session. This was acceptable for archival purposes, but limited the general convenience of CD-R and CD-RW discs as a removable storage medium. Packet writing is a scheme in which the recorder writes incrementally to disc in short bursts, or packets. Sequential packet writing fills the disc with packets from bottom up. To make it readable in CD-ROM and DVD-ROM drives, the disc can be closed at any time by writing a final table-of-contents to the start of the disc; thereafter, the disc cannot be packet-written any further. Packet writing, together with support from the operating system and a file system like UDF, can be used to mimic random write-access as in media like flash memory and magnetic disks. Fixed-length packet writing (on CD-RW and DVD-RW media) divides up the disc into padded, fixed-size packets. The padding reduces the capacity of the disc, but allows the recorder to start and stop recording on an individual packet without affecting its neighbours. These resemble the block-writable access offered by magnetic media closely enough that many conventional file systems will work as-is. Such discs, however, are not readable in most CD-ROM and DVD-ROM drives or on most operating systems without additional third-party drivers. The division into packets is not as reliable as it may seem as CD-R(W) and DVD-R(W) drives can only locate data to within a data block. Although generous gaps (the padding referred to above) are left between blocks, the drive nevertheless can occasionally miss and either destroy some existing data or even render the disc unreadable. The DVD+RW disc format eliminates this unreliability by embedding more accurate timing hints in the data groove of the disc and allowing individual data blocks (or even bytes) to be replaced without affecting backward compatibility (a feature dubbed "lossless linking"). The format itself was designed to deal with discontinuous recording because it was expected to be widely used in digital video recorders. Many such DVRs use variable-rate video compression schemes which require them to record in short bursts; some allow simultaneous playback and recording by alternating quickly between recording to the tail of the disc whilst reading from elsewhere. The Blu-ray disc system also encompasses this technology. Mount Rainier aims to make packet-written CD-RW and DVD+RW discs as convenient to use as that of removable magnetic media by having the firmware format new discs in the background and manage media defects (by automatically mapping parts of the disc which have been worn out by erase cycles to reserve space elsewhere on the disc). As of February 2007, support for Mount Rainier is natively supported in Windows Vista. All previous versions of Windows require a third-party solution, as does Mac OS X.
Owing to pressure from the music industry, as represented by the IFPI and RIAA, Philips developed the Recorder Identification Code (RID) to allow media to be uniquely associated with the recorder that has written it. This standard is contained in the Rainbow Books. The RID-Code consists of a supplier code (e.g. "PHI" for Philips), a model number and the unique ID of the recorder. Quoting Philips, the RID "enables a trace for each disc back to the exact machine on which it was made using coded information in the recording itself. The use of the RID code is mandatory." Although the RID was introduced for music and video industry purposes, the RID is included on every disc written by every drive, including data and backup discs. The value of the RID is questionable as it is (currently) impossible to locate any individual recorder due to there being no database. The Source IDentification Code (SID) is an eight character supplier code that is placed on optical discs by the manufacturer. The SID identifies not only manufacturer, but also the individual factory and machine that produced the disc. According to Phillips, the administrator of the SID codes, the SID code provides an optical disc production facility with the means to identify all discs mastered or replicated in its plant, including the specific Laser Beam Recorder (LBR) signal processor or mould that produced a particular stamper or disc. The standard use of RID and SID mean that each disc written contains a record of the machine that produced a disc (the SID), and which drive wrote it (the RID). This combined knowledge may be very useful to law enforcement, to investigative agencies, and to private or corporate investigators. ^ a b "Computer Peripherals - Chapter 12. Optical Disks" (PDF). Nanyang Technological University, Singapore. October 16, 2001. Retrieved 2011-07-16. ^ "Sony Shows 'DVR-Blue' Prototype". CD R Info. October 11, 2000. Retrieved October 17, 2007. ^ Liadov, Maxim. "Sony BDZ-S77 Recorder Review". Digit-Life. Retrieved October 19, 2007. ^ "Exclusive TDK Durabis Coating Technology Makes Cartridge-Free, Ultra-Durable Blu-ray Discs a Reality". Phys.Org. January 9, 2005. Retrieved October 18, 2007. ^ Costa, Dan (June 15, 2006). "Samsung Ships the First Blu-ray Player". PCMag.com. Retrieved October 17, 2007. ^ Sony Rearranges Blu-ray Release Schedule. High-Def Digest, June 15, 2006. ^ "Sony Unveils First Blu-Ray Disc Drive Burner". Sony. July 18, 2006. Retrieved January 22, 2010. ^ Taylor, Jim H.; Johnson, Mark R.; Crawford, Charles G. (2006). DVD Demystified. McGraw-Hill Professional. pp. 7–8. ISBN 0-07-142396-6. ^ Stan, Sorin G. (1998). The CD-ROM Drive: A Brief System Description. Springer. p. 13. ISBN 0-7923-8167-X. ^ Cross Section of DVD+R DL Optical Media. ^ Page, M. Kenwood 72× CD-ROM Review. p. 2. Retrieved 2007-10-08. ^ Spurgeon, Brad (December 11, 2004). "Spinning out of control: Risk of CD explosion". The New York Times. Archived from the original on March 25, 2014. ^ "| Wii - General Information: System & Accessories". Nintendo. Retrieved 2013-01-07. ^ PlayStation 3 Instruction Manual (PDF). p. 50. Retrieved 2012-11-12. ^ CD-210PU USB interface portable CD-ROM drive. TEAC. Retrieved 2007-10-08. ^ a b "Intellectual Property & Standards/Licensing Programs". Philips. Retrieved 2010-07-27. ^ "Pocket guide to recognising pirate music products" (PDF). International Federation of the Phonographic Industry. Retrieved 2010-07-27. Wikimedia Commons has media related to Optical disc drive. An IDE ODD (Top) and a SATA ODD (Bottom). Both are designed for laptops. An IDE ODD. It is 5.25-inch in form factor. A SATA ODD. It is 5.25-inch in form factor. This page was last edited on 2 April 2019, at 18:19 (UTC).